Apartments "Katic" are located in the very center of Trpanj, on the main road, next to the Post Office. Physical and Postal addresss is same: 13 Kralja Tomislava Street. There are 10 apartments in the main building, all apartments are different sizes - please visit our gallery to see pictures of apartments and find out which one suits you best! 30 years experience in tourism stands behind our family business. We poured our expertise into "Katic" apartments, trying to build a place that would make your stay both pleasant and comfortable. We are open for business 365 days a year! Please check our price list on the bottom of this page. Each apartment comprises bedroom, open plan kitchen/dining room/living room, bathroom, balcony and an entrée. Kitchen is fully equipped with modern cooking utensils. Bigger apartments have two folding-out couches that can be used as beds. Each balcony is equipped with garden furniture. 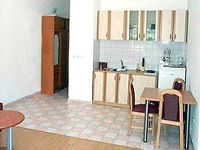 Apartments are completely renovated in 2003. 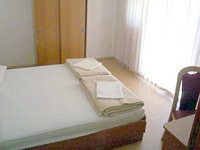 During these renovations apartments have been fitted with modern, tasteful, new furniture and appliances. 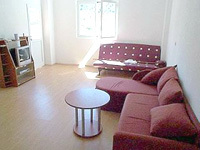 All apartments have a TV set with a satellite link, telephone and an air-conditioner. Guests visiting with own vehicles will enjoy free secure parking next to apartments building. All our guests enjoy special discount in the local Diving School as well as in some stores! High-speed internet connection is available at request, charged at favourable rates (same as any local internet cafe). For your convenience there is a general store on the ground floor of our apartments building. Store is open 06:00 - 22:00. It stocks wide variety of food, cool drinks, toys, souvenirs, post cards, all sorts of fresh bakery and deli products. Our Reception dubs as a Concierge desk. Here, you can enquire about local customs, culture, places to visit, etc. At reception you can receive an extra blanket or a high-chair for your child. We offer special one-day trips to Medjugorje, Korcula or Dubrovnik! We use own mini-bus and organise lunch in local restaurants for your convenience. Make a booking at our reception, or contact us via phone or e-mail. We offer rent-a-car, rent-a-bike, rent-a-scooter facilities as well as Bureau de Change. We can organise custom designed day-trips all over Peljesac peninsula, as per your interest. We recommend a hiking trip to the top of Mt. Viper (981m above sea level). This is for serious hikers only, but your reward will be a magnificent view of the mid-Adriatic: Peljesac, Korcula, Hvar, Mljet and the seemingly endless blue sea. With some luck you will encounter indigenous wild life: wild mountain goats and a local variant of jackals! Local wine, olive oil, sage honey, lavender oil and many other typical Mediterranean products are still hand made by local farmers and co-ops and can be bought through us. Please supply the following information when making a booking: number of guests; duration of visit; which apartment you wish to stay in.